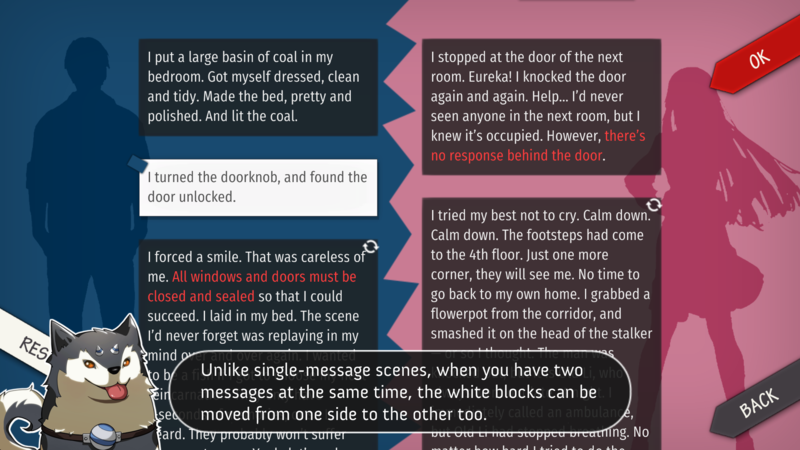 WILL: A Wonderful World is an innovative visual novel style puzzle game. Playing as a “god”, you wield the power of shaping the fate of the “mortals” who seek your help. Stories are told through messages and prayers sent to you from the “mortals”. 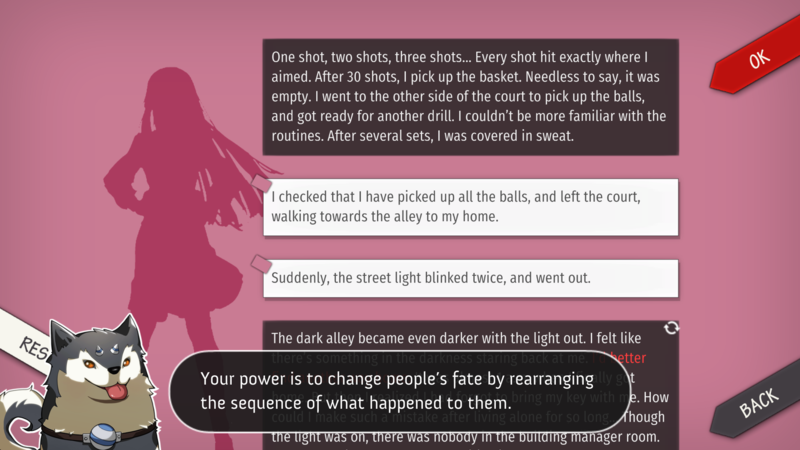 Unlike most visual novels in which you are mostly taking multiple choices tests, you are able to change the characters’ fate by rearranging snippets of stories in their messages. In other words, you advance the game not by making subjective choices on their behalf, but by changing the objective events that happened to them. With your power, you can alter the sequence of one’s actions, swap events between mortals, or even switch their blood types. You are the “god” who bestows your benevolence (or wrath) upon the “mortals”, by manipulating the causes and the consequences. Each level has multiple endings yielded from hundreds, even thousands of possible combinations. The endings might be happy, sad, funny, solemn, or more, all at the same time. Only a selected few endings will further unlock the future plots, but exploring all possible endings will help you understand the story better. WILL: A Wonderful World has about 70 scenes in total. Your goal is to help solve the problems of the “mortals”, using your godly power, and unveil the truth behind the wonderful world. 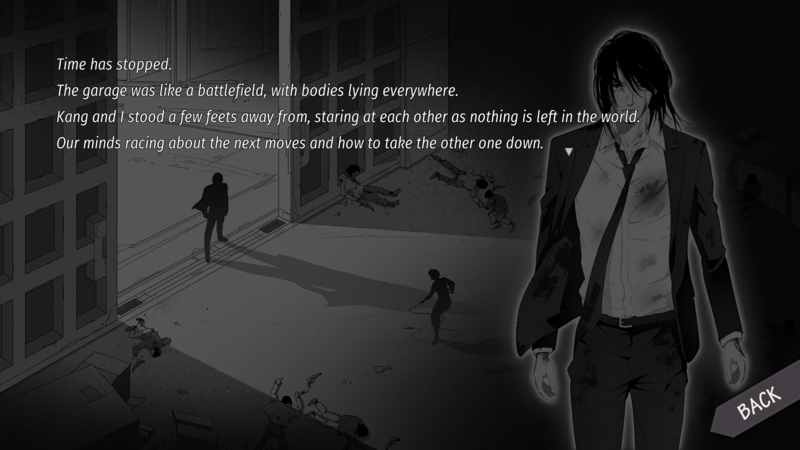 The development of the game started back in February, 2015. The team is currently working full steam on it, and we expect to release the complete game by the end of 2016. As it is still under development, contents in the promo video, including but not limited to graphics, music and character designs are subject to change and improvements. People who believe in the legend live all over this world, in every shape and form. They write and pray to the god, seeking help for their troubles. Even a stray cat who would be satisfied with just some foods. There are more, but I shall not spoil it for you. God is good, and makes choices for the greater good. However, are they really the best choices for mortals? What would the world be like if such a god exists? What if, you can be the god? 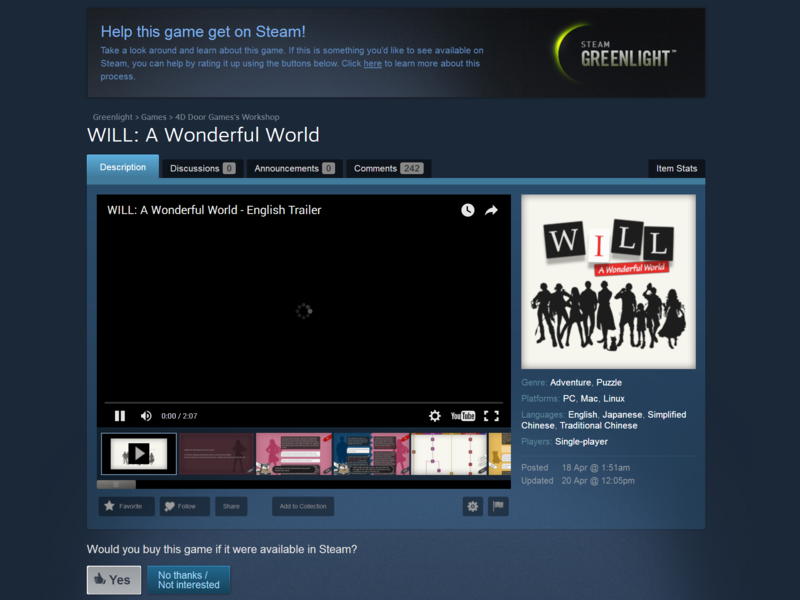 WILL: A Wonderful World is now on Greenlight!